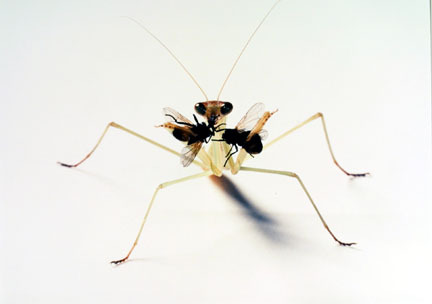 Catherine Chalmers photographs a variety of insects and amphibians as they move through the natural cycles of life, including those of reproduction and sustenance. 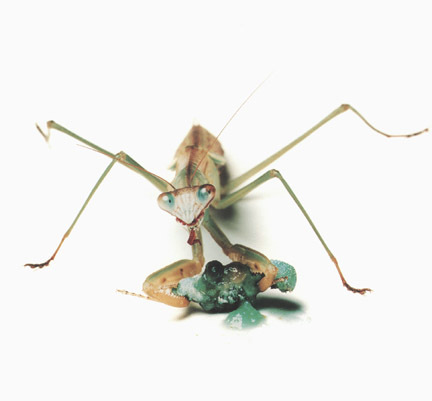 For her series Food Chain, from which Praying Mantis Eating a Caterpillar is taken, such events were photographed in vivid color against a stark white ground. The sterile background implies an atmosphere of objectivity and observation, and what happens in front of it – and in front of Chalmer's camera – are events not normally witnessed by human eyes. Catherine Chalmers was born in San Mateo, California, in 1957. Before she received an MFA degree in painting from the Royal College of Art, London, Chalmers earned her BS in engineering from Stanford University. 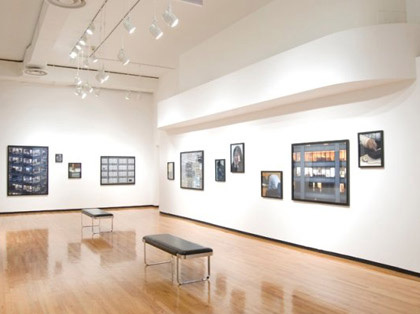 Chalmers's photographs have recently been exhibited at the Ansel Adams Center for Photography, San Francisco; New Museum of Contemporary Art, New York; Reykjavik Municipal Art Museum, Iceland; White Columns, New York; and the Yukon Arts Center, Whitehorse, Canada, among others. In 1999 her work was featured in the exhibition The New Natural History at the National Museum of Photography and Film, Bradford, England.